In the last week or so, gold has eased lower from a nine month high back towards the key level of $1300, where it will be expecting to receive support from. Only last week gold enjoyed a solid push higher, breaking through resistance at $1300 and reaching the high. 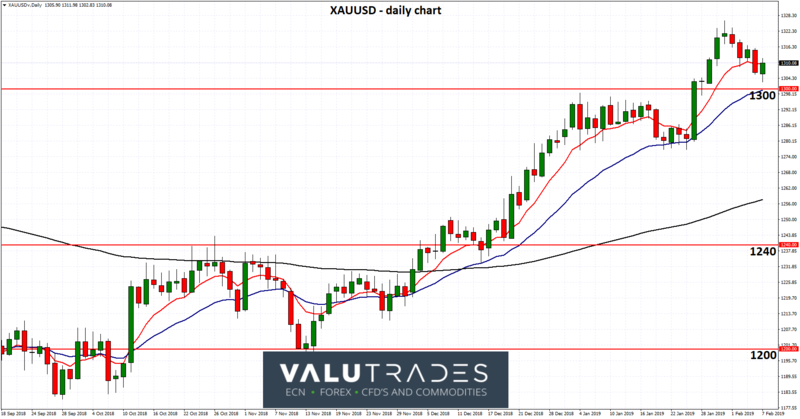 The significance of $1300 is for several weeks, gold met stiff resistance at this level, after enjoying a healthy surge higher throughout December. The $1300 level is now likely to offer support should gold decline a little and look to ease lower. The move higher in December saw gold move to a then six month high just shy of $1300 after enjoying some solid support from the key $1240 level and the $1200 level before that. For a couple of weeks before the push higher gold consolidated a little resting on support at $1240 after making a strong rally back towards this level, which had become significant when it offered reasonable resistance halting its climb a couple of months ago. Ongoing concerns over the United States - China trade dispute and its potential impact on global growth have continued to support gold. It has been reported that U.S. President Donald Trump and Chinese President Xi Jinping are unlikely to meet before 2nd March, which is the deadline the countries set for reaching a trade deal. In other news, last week U.S. unemployment benefits dropped from a 1 1/2 year high to 234,000, as economists polled by Reuters had forecast claims falling to 221,000. The U.S. Federal Reserve kept interest rates steady and increasing concerns about global growth have generally kept equity markets subdued. A sign of the struggles was India cutting interest rates unexpectedly and data showing that Germany's economy had slowed in December, stoking fears of a broader slump in Europe. Former U.S. Federal Reserve Chair Janet Yellen has said that the central bank's next move may well be an interest rate cut if weakening growth around the world starts infecting the U.S. economy. "Of course, it's possible. If global growth really weakens and that spills over to the United States where financial conditions tighten more and we do see a weakening in the U.S. economy, it's certainly possible that the next move is a cut," she said. "But both outcomes are possible."